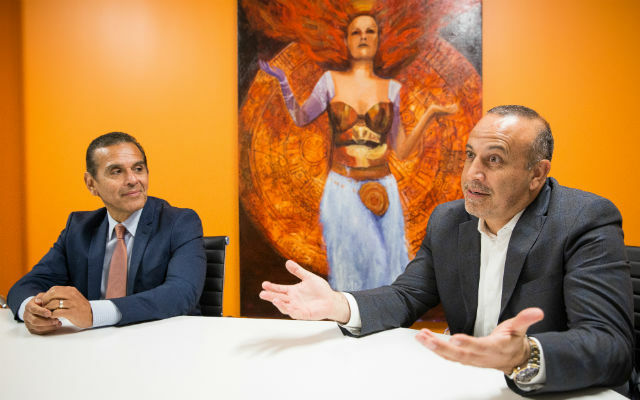 California Democratic gubernatorial candidate Antonio Villaraigosa (left) and Republican political consultant Mike Madrid in the offices of Grassroots Lab in Sacramento. Photo by Max Whittaker for CALmatters. 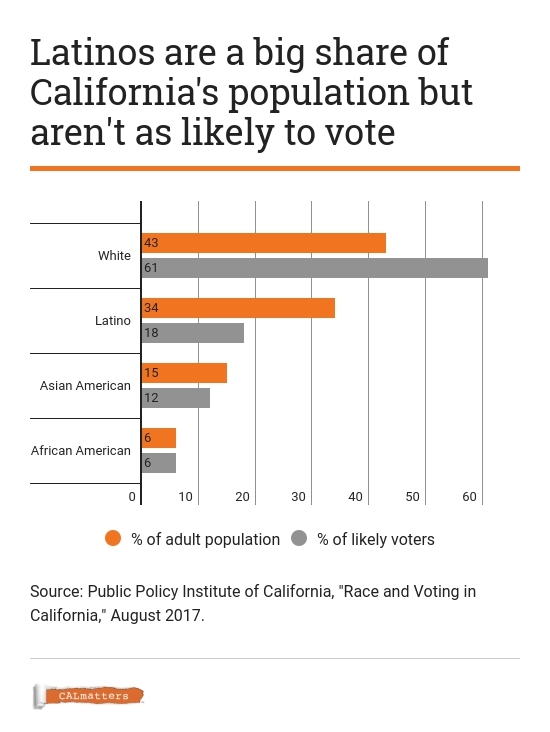 What both men believe, however, is that Latinos—California’s largest ethnic group—suffer disproportionate levels of poverty in part because they barely turn out to vote. That common ground helps form the basis of an unlikely political alliance that could shape the 2018 race to determine the next governor of California. Democrat Antonio Villaraigosa—a former mayor of Los Angeles and speaker of the Assembly—has hired a Republican political consultant to work on his campaign to become California governor. The GOP consultant, Mike Madrid, is a widely recognized expert in Latino voting patterns who has long urged Republicans to reach out more to Latino voters. He was the California Republican Party’s political director in the 1990s and, more recently, has been paid by the state party to research local government elections. But Madrid has been so turned off by Donald Trump that he says he did not vote for a president last year and has begun criticizing his party for adopting a nationalistic tone. Though working across party lines is not unusual in governing, it is less common in the more combative realm of electoral politics. Villaraigosa had a Republican chief of staff when he was mayor of Los Angeles. Madrid has done research for the Legislature’s Latino Caucus, which is only open to Democrats. But this race marks the first time either man has formally joined forces with someone from the opposite party during a political campaign. Their bipartisan alliance comes as California has shifted to an open-primary system, in which the “top two” vote-getters on the June ballot will advance to the general election—even if they are from the same party. So far four Democrats and two Republicans have entered the governor’s race, and the most recent poll shows Villaraigosa in second place to fellow Democrat Gavin Newsom, the lieutenant governor and former mayor of San Francisco. The “top two” system was designed to nudge candidates to appeal to voters beyond their own party, although Villaraigosa said it was not a factor in his decision to hire Madrid. The two men share similar biographies—the grandchildren of Mexican immigrants, both grew up in working class families in Southern California. But long before they joined forces, they were political rivals. In the 1990s, Villaraigosa was speaker of the Assembly and Madrid was the press secretary to the Assembly Republican leader. As a consequence of a political spat neither leader can explain today, Villaraigosa had stopped issuing paychecks to the Republican leader’s staff. After a few months, Madrid—whose job required him to live in Sacramento, away from his Southern California home—was going broke and decided he had to confront Villaraigosa. “I said, ‘Look, I’ve got a pregnant wife at home and I’m sleeping on my friend’s couch. I need to get my paycheck approved. Can you help me out?’” Madrid recalled. Both Villaraigosa and Newsom have progressive track records—supporting gun control, marijuana legalization and gay marriage. But Villaraigosa clashed with labor unions during his tenure as L.A. mayor and blamed teacher unions for low performance in the city’s schools. In their race for governor of this overwhelmingly Democratic state, Newsom has won endorsements from the teachers’ and nurses’ unions, while Villaraigosa is positioning himself as more of a centrist. He frequently talks about the state’s economic divide and has called for limiting statewide regulations, themes California Republicans have used to attack ruling Democrats. If Villaraigosa embraces the Republican argument that de-regulating industry will lead to more jobs, “that’s going to be a big problem,” said Steve Smith, spokesman for the California Labor Federation, a powerful union umbrella group that has not yet endorsed a candidate in the race. “That won’t pull him to the right, it will explain his record to a broader base of voters,” Madrid said. Separately, Madrid is part of a new nonprofit group that is trying to increase turnout among Latino voters. Latinos make up just 18 percent of California’s likely voters even though they’re 34 percent of the state’s adult population, according to the Public Policy Institute of California. The new group, Civica Latina, plans to hire field organizers to talk to voters and launch a social media campaign on the importance of voting. It’s focused on the June primary because Latino turnout has been at least 30 points lower in primaries than general elections. Because of its tax-exempt status, the group is prohibited from campaigning for specific candidates. If successful, however, the effort could wind up aiding Villaraigosa—the only Latino running for governor—along with other Latinos pursuing down-ticket offices. As Madrid notes, California is home to 2.7 million Latino Democrats and 677,330 Latino Republicans. Research by a UCLA professor has found that Latinos are more likely to vote when Latinos are on the ballot—and that many will cross party lines to vote for a fellow Latino.